Finally, I come to the youngest child of Moses Sr. and Adeline Cohen, Rachel Cohen. This line is the last line of the extended family tree of Hart Levy and Rachel Jacobs Cohen, my great-great-great grandparents. Although there are still quite a few unanswered questions in the Cohen saga, once I write about Rachel and her family, I will have covered all of the known descendants of Hart and Rachel, including both the Philadelphia branch and the Washington branch of the family, as best I can at this point. I will reflect on the DC branch and on the overall Cohen family once I’ve written about Rachel. 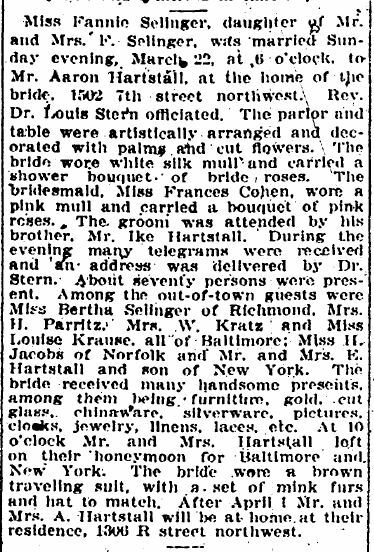 On January 10, 1880, Rachel, as I wrote earlier, had married Frederick Selinger of Hurben, Germany, the presumed older brother or cousin of both Julius and Alfred Selinger, who married Rachel’s nieces Augusta and Fannie Cohen, respectively. When I last wrote about Frederick and Rachel, I thought that they had had only two children, Fannie and Monroe, but further research uncovered that there may have been another child. There is a record for a male child born in Washington, DC, on January 9, 1881, whose parents were “Rachael Cohen” and “Frederick Sclinger”—clearly an erroneous transcription of Selinger. There is also a death record for a three year old child named Reuben Sellinger dated December 12, 1884, so born in 1881. Although I do not have the death certificate for that child, it certainly seems that this must have been the same child born to Rachel and Frederick in 1881. I am going to see if I can obtain the death certificate to learn what happened to Reuben. Rachel and Frederick did have two children who lived to adulthood, Fannie, born in 1882, and Monroe, born in 1888. As I researched more deeply into the story of Rachel and Frederick, I also learned that Frederick was not always in the furniture business. In fact, in 1880 when he married Rachel, he was listed only as working as a clerk in a store. The 1882 DC city directory gives more insight into what type of store; it says he was a pawnbroker. The 1886 directory adds to this by listing Rachel Selinger as a pawnbroker and Frederick as a clerk. Remembering that Moses and Adeline Cohen had at times been pawnbrokers, I now think that Frederick was working in what was at first his mother-in-law’s business (Adeline was living with the newly married couple in 1880) and then his wife’s business. The 1887 and 1888 directories also list Rachel as the pawnbroker and Frederick merely as a clerk. Rachel is one of the very rare married women I have found as working outside the home and listed separately in a directory. This is even more surprising given that Rachel had a child born in 1882 and in 1888 and had lost a child in 1884. 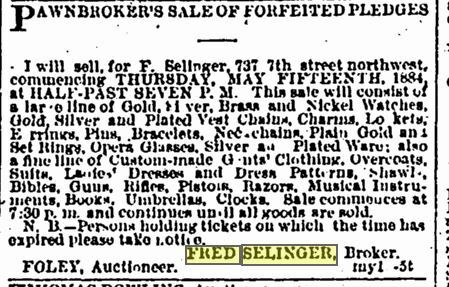 On the other hand, I found numerous ads which refer only to Fred Selinger as the pawnbroker. In 1890, Rachel, Frederick and their family were living in Sioux City where her brothers JM and Hart as well as her mother were then living. The 1890 Sioux City directory lists Rachel as the owner of a general store and Frederick as the manager. The 1892 directory does not list Rachel, but lists Frederick as working as clerk for JM Cohen, his brother-in-law. The 1892 directory lists JM as a broker, meaning a real estate broker, which is the occupation given for him on the 1890 Sioux City directory. By 1895, Rachel, Frederick and family had returned to Washington, DC, residing at 1424 7th Street, NW. Frederick was working in a clothing store, according to the 1895 directory. The 1896 directory has Rachel listed as in the clothing business with Frederick as a clerk. By 1898 they had moved to 1502 7th Street, NW. Again, Rachel is listed as in the clothing business, and Frederick is listed as a clerk. On the 1900 census, Rachel is listed without an occupation, and Frederick is listed as a merchant of dry goods. The 1900 directory included him in the category of second hand clothing. There was no listing of Rachel in the 1900 directory or in the 1901 directory, which still had Frederick at 1502 7th Street in the clothing business. Then in 1904 there is a change; Frederick is now in the furniture business, but in 1905 Rachel appears again in the directory in the clothing business; Frederick has no occupation listed. They were still at the same address. In 1906, 1907, and 1908, Rachel’s business is given as men’s furnishings, and Frederick is listed as a clerk. Their two children Monroe and Fannie are also listed as clerks in some of these years. Although the erratic pattern of Rachel and Frederick’s occupations made me wonder about their financial situation, it would appear from this description of the wedding that they were able to afford a fairly expensive celebration for their daughter’s wedding. Aaron and Fannie Hartstall’s son Morton was born on January 20, 1910. Aaron continued to work as a paperhanger throughout the next three decades. In 1910, Frederick and Rachel were now living at 317 R Street NW, and Frederick was in the furniture business, according to the census. No occupation was given for Rachel. Their son, Monroe, who was 22 in 1910 and living at home, was working as a clerk for the government at that time. Given his occupation as described on later documents, I believe he was a clerk for the US Post Office, or what we now call the US Postal Service. Frederick was no longer selling furniture in 1911; he was now, like his son, a clerk at the post office. Both were living at 317 R Street; I assume Rachel was as well. The young couple settled in Washington, DC. In the 1912 DC directory, Monroe is listed as a post office clerk and residing at 126 Randolph Place; his father is listed at the same address in the directory. Rachel’s name is not included in the listing. In 1914, Monroe and Estelle had their first child Adelyn, and they were now living at 31, 1430 NW. Three years later their son Eliot was born. Monroe was working for the US Post Office, according to both his World War I draft registration and the 1917 directory, which gave his address now as 1440 Oak Street NW, the same address listed for his father Frederick. Monroe was also at the same address and still working for the post office on the 1920 census. 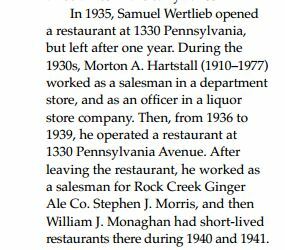 By 1921, however, he had left the post office and was working as a clerk for the O’Donnell Drug Company. I could not find Rachel on the 1920 census, but I did find Frederick living as a lodger at 103 Maryland Avenue right near the US Capitol and working as a clerk at the post office like his son Monroe. Rachel was not listed with him. In the DC directory for 1921, Frederick was listed as a clerk for Sanitary Grocery and residing at 103 Maryland Avenue. I do not know where Rachel was or for how long she and Frederick may have been living apart. Then tragedy struck on May 30, 1923, when Monroe and Estelle’s daughter Adelyn died; she would have been only nine years old. I have ordered her death certificate and will report on her cause of death once I receive it. UPDATE: I’ve received Adelyn’s death certificate. She died of meningitis and mastoiditis, a bacterial infection of the mastoid bone, which is located behind the ear. According to WebMD, these infections are usually caused by a middle ear infection that has not been successfully treated. Once again, I am grateful for modern medicine and all that pink amoxycillin my kids took for ear infections. Notice also that the informant on the death certificate was Aaron Hartstall, Adelyn’s uncle, her father’s brother-in-law. I assume that her parents. grandparents and aunt were too distraught to provide the details for the death certificate. Rachel still did not appear in the 1924 directory, but Frederick did. 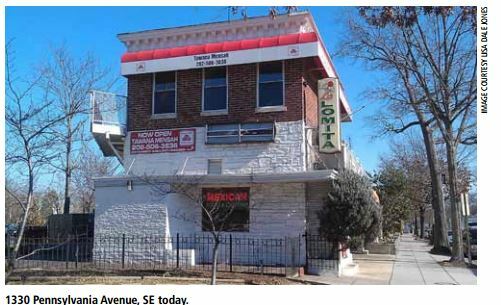 He is listed as “bg mgr” of Washington Salvage Company and residing at 1913 14th Street NW. I also could not find Monroe in the 1924 directory. By 1928, Monroe had switched to the clothing business, and he, Estelle, and Eliot, their remaining child, had moved to 1465 Girard Avenue, NW. Frederick is listed in that 1928 directory as the manager of North Capital Salvage, residing at 733 North Capital Street, NE, and then, in 1929, both he and Rachel are listed at that address, both working for North Capital Service. On the 1930 census, they are still at that address, and Frederick is listed as the owner of a general store. Perhaps North Capital Service was the name of that store. Rachel and Frederick were by this time almost eighty years old, living together and working together. Three years later in 1933, they were listed as living together at 1438 Meridian Place, NW, without any occupations. That was the last listing I found that includes Rachel. In 1934, only Frederick is listed at that address, and on the 1940 census, Frederick is listed as a widower, living with his daughter Fannie Hartstall. Although I have not yet found a death record, Rachel must have died in either 1933 or 1934. She would have been 79 or 80 years old. The extended family lost two other members during that time period. 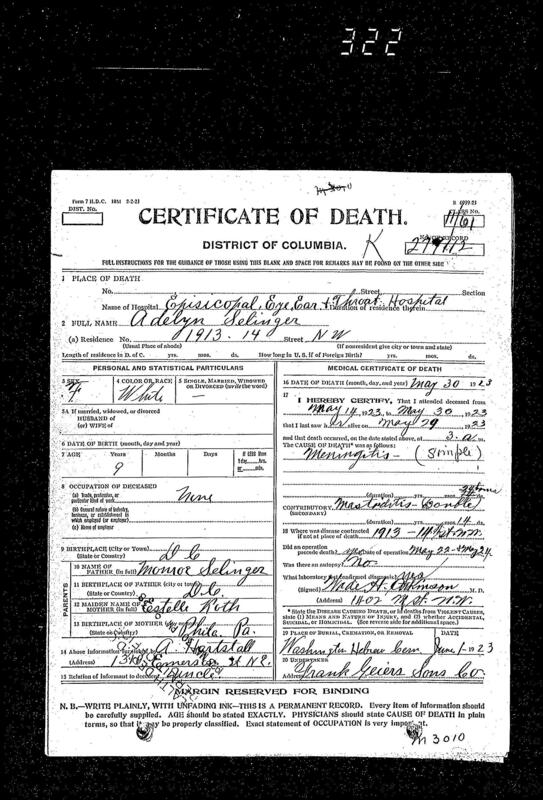 Aaron Hartstall, Fannie Selinger Hartstall’s husband, who had continued to work as a paperhanger throughout this entire time, is listed on the 1938 Washington Directory, but must have died between 1938 and 1940 because Fannie is listed as a widow on the 1940 census. Aaron would have been about 62 years old. Fannie continued to live at 705 Allison Street, NW, where she and Aaron had lived for many years; in 1940, her father Frederick and her brother-in-law Isaac Hartstall were living with her. Fannie not only lost her husband and her mother during this period; she also lost her brother Monroe. Although Monroe is listed on the 1935 DC directory as a salesman for the People’s Army and Navy, he does not appear again. 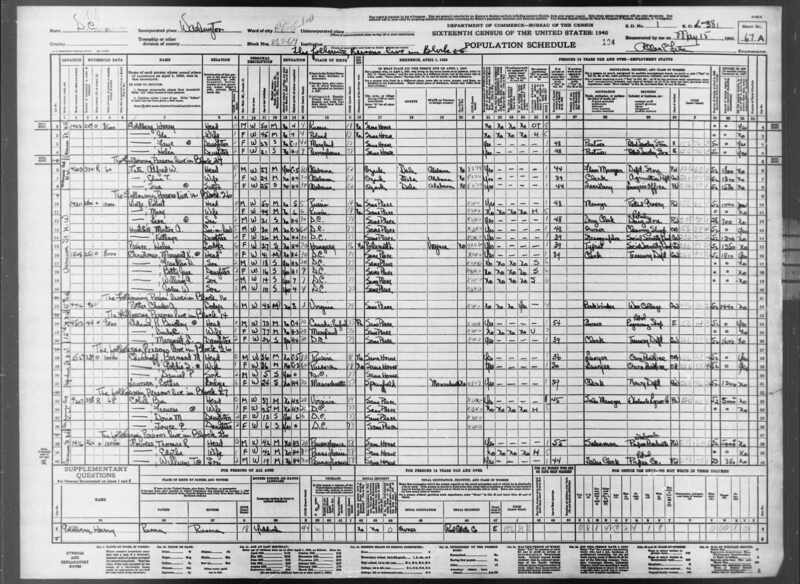 I cannot find him or his family on the 1940 census. 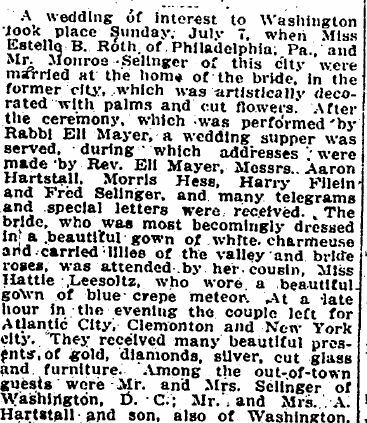 The November 29, 1949 announcement in the Washington Post of his son Eliot’s engagement referred to him as “the late Monroe Selinger,” so Monroe must have passed away sometime between 1935 and 1949. In fact, Eliot and his mother Estelle were living in Hartford, Connecticut, in 1945, after Eliot completed his military service, so it would appear that his father had died before 1945. He would have been only 61 years old. Unfortunately I have not been able to find a death record or an obituary for Monroe Selinger or Aaron Hartstall or Rachel Cohen Selinger. Meanwhile, the next generation had become adults by 1930. Morton Hartstall, the son of Aaron and Fannie, was twenty years old in 1930, and he was then working as a clerk for the Chamber of Commerce. In 1931 he was still working for the Chamber of Commerce and still living at home. By 1934 he had changed jobs again and was working as a salesman for a store called Goldenberg’s. He was still at home on Allison Street with his parents. (The article goes on to describe the rest of the history of the building, which is still being used as a restaurant today.) In 1940 Morton and Kathryn were living with her parents in Washington, DC; Morton was now the owner of a “cleaning shop,” and Kathryn was a stenographer for Social Security. As for Eliot Selinger, the only other grandchild of Rachel and Frederick Selinger to survive to adulthood, one record says that he served in the US military from March 16, 1943, until May 7, 1943. I wonder whether his release in May was related to his father’s death. As stated above, he and his mother were living in Hartford in 1945, but returned to Washington in 1946. He was engaged to Jane Ruth Simon in 1949, and they had two children. Eliot was the owner of Selinger Associates, a hardware manufacturer’s representative, a business he established in Washington after the war. I do not know when Frederick Selinger died. He was 83 in 1940, the date of the last record I have for him. His daughter Fannie died in January, 1967. She was 84. Both lived far longer than their spouses. Unfortunately, Fannie’s son Morton did not live as long as his mother did, but rather like his father, he died before he turned seventy. He died in April, 1977, when he was 67 years old. His wife Kathryn was still alive in 1995; I have no later record for her. I do not know whether Morton and Kathryn had any children. Morton’s first cousin Eliot also was not blessed with longevity, but sadly like his father Monroe, he died before he turned 70. He died on September 1, 1982, and was only 64 years old. His wife Jane died June 13, 2008. They are buried at Washington Hebrew cemetery and were members of Washington Hebrew Congregation. Looking back over the life of Rachel Cohen Selinger and her children, I see a life that seems to have had some ups and downs. Frederick changed jobs fairly often, they moved fairly often, and they may have even lived separately for some period of time. They lost a child early in their marriage. On the other hand, they worked together and lived together for many years, ending up together until Rachel died in 1934. Their two children who survived to adulthood, Fannie and Monroe, seem to have had more consistent patterns in their lives. Fannie was married to Aaron for many years, and he worked at the same location as a paperhanger for all of that time. Their son Morton owned a couple of businesses of his own. Monroe worked as a postal clerk for several years and then became involved in clothing sales. He and his wife Estelle lost a young child, as his parents had many years earlier, but their surviving child, Eliot, owned a successful business in Washington for many years and had two children who survive him. With that, I have now tracked as best I can all of the descendants of Hart Levy Cohen and Rachel Jacobs, my great-great-great grandparents. It has been quite a journey, and before I move on to my next line, the Seligmans, I need to spend some time looking back and thinking about the bigger picture and the lessons I’ve learned from studying my father’s father’s father’s family. 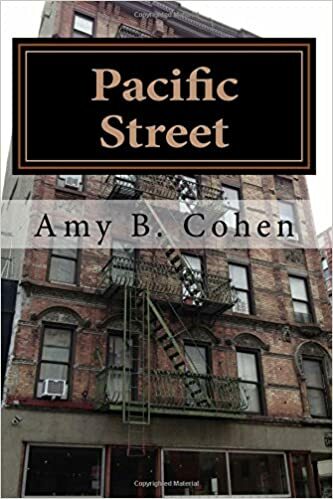 This entry was posted in Cohen, DC and tagged Cohen, Frederick Selinger, genealogy, Monroe Selinger, Rachel Cohen, Selinger, Washington DC, Washington Star by Amy. Bookmark the permalink. I believe I may have something that is apart of your family history. I was out shopping for vintage items and I came across a 4 pack of vintage matches. Yes matches. I guess the gentleman in your story above by the name of Eliot who owned the hardware and building products direct representative store Selinger’s in DC….he at some point ordered advertising matches from Regal Match Company in Baltimore with the company name on it and a picture of a female on the front. Please contact me so we can discuss this further and I can make sure these belonged to Eliot. Email me. Thank you. I will email you tomorrow. Thanks! Hi Elise, thanks so much for reading and for commenting. I was in touch with your father a while back, and I am so pleased to be in touch with you as well. I will drop you an email. Hi Amy , A very moving story, thinking of it from Rachel’s perspective in particular. What an incredible Lady. History does resonate through the generation’s . Thanks, Shirley. It certainly does! Here we are today, long lost cousins, discovered because of a wedding invitation you found from over 100 years ago. Amazing!